Paul Gauguin is another early "traditional-modern" painter. 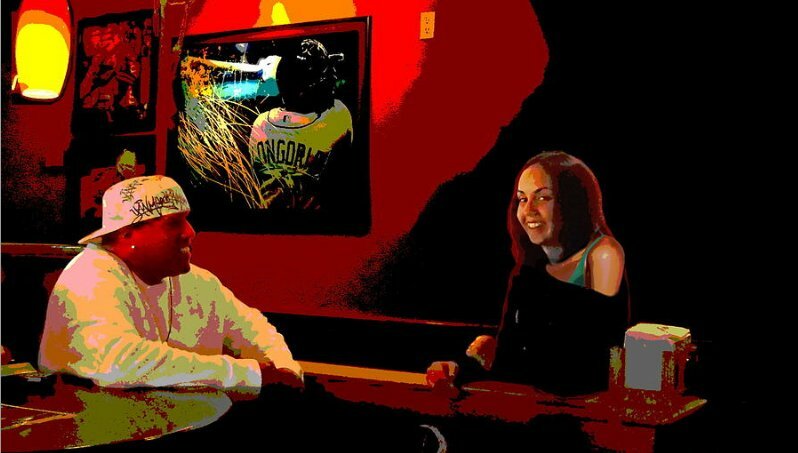 He maintained a lot of the impressionist ideas of motif; i.e., art relating to, in the 19th century , "modern" outlooks on the real world, but with his own post-impressionist style. 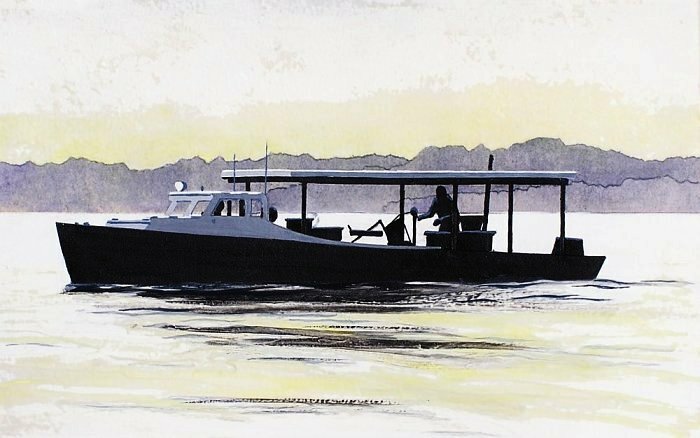 "Modern" here is in contrast to pre-impressionist art, which was so often (but not always) so banal. "Eugène Henri Paul Gauguin ... was a leading French Post-Impressionist artist who was not well appreciated until after his death. 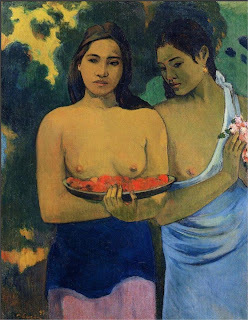 Gauguin was later recognized for his experimental use of colors and synthetic style that were distinguishably different from Impressionism. 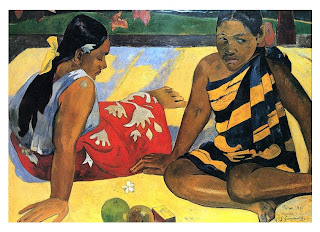 His work was influential to the French avant-garde and many modern artists, such as Pablo Picasso and Henri Matisse ..."
Gauguins art encompassed a wide variety of motif (see thumbnails below), I am showing here a few of his Tahitian pictures. "... the front figure indulges in dreamy fantasies, the rear figure is imbued with something rigid and rule-bound. The front woman stretches herself, her facial features stylized and simplified. The rear female figure ... face is painted with individual features and represents the center of the image. ..."
I sometimes (almost always???) think that art academics get carried away... To me, as a painter, and with a son and daughter, this could more basic; there is mom, or aunt, and daughter; daughter looks like daughter, mom looks like mom, neither of them really are sure they want to be sitting there getting painted. 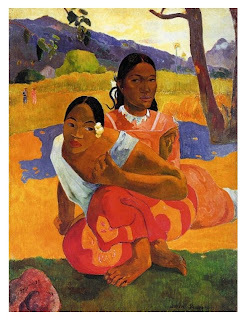 Gauguin apparently was very mercurial, full of ups and downs, maybe mostly downs. Many of his pictures seem to reflect Gauguin, in this way; not necessarily those being painted. 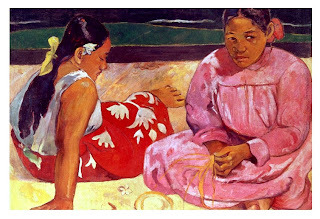 Concerning Gauguin's impact on Picasso John Richardson wrote, "The 1906 exhibition of Gauguin's work left Picasso more than ever in this artist's thrall. 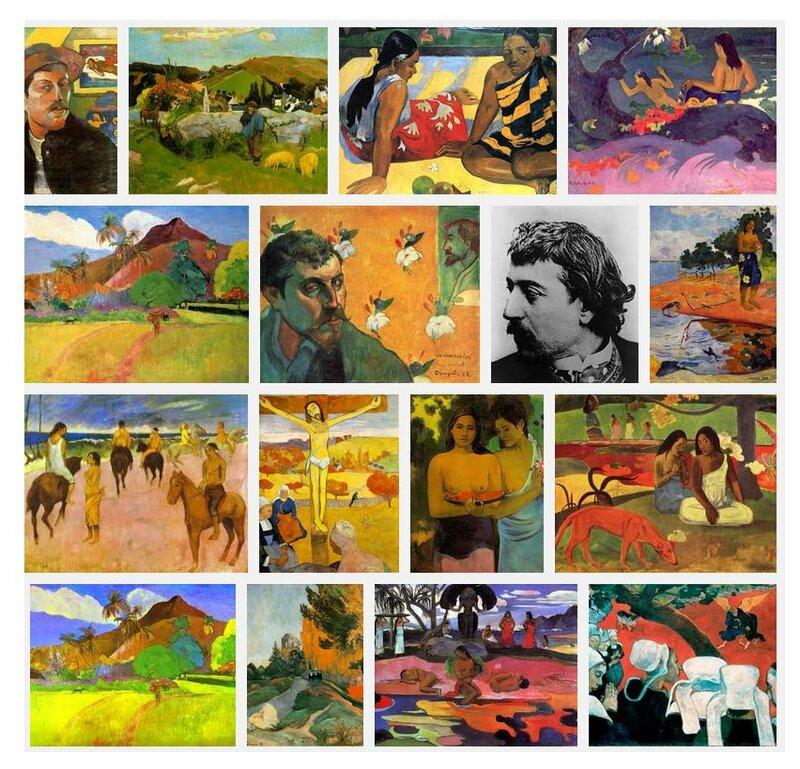 Gauguin demonstrated the most disparate types of art—not to speak of elements from metaphysics, ethnology, symbolism, the Bible, classical myths, and much else besides—could be combined into a synthesis"
His self-portraits are obviously how he wants to see himself. One thing I find interesting is how often his other portraits look sort of like Gauguin; this is actually quite noticeable for many other artists also.